Chemical Growth Suppression using Herbicides. Erosion Control Structures and Gabions. Farmland and Bush encroachment methods. Grass Cutting for Telkom, Rand Water etc. Land Re-instatement - grass and trees. Land Re-vegetation - grass and trees. Mechanical and Chemical Bush Control. Selective Foliar Weed Control in lawns. Selective Foliar Weed Control on alien species. Street tree Maintenance and wood chipping. 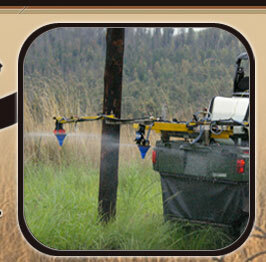 Total Weed Control along roads. Works elsewhere in Southern Africa.